I only have a few more quiet moments before the day swings into high gear. The few moments early in the morning after some reflection and quiet time often go took quick. But I wanted to let everyone know we are doing pretty good. Edric’s first night home went really well, he slept almost all of the night. He woke once with a dirty diaper and I ended up sleeping with him in his bed after that, but all in all it went really smooth. We’ve shrunk our world down a lot and are just working on getting into a simple routine. Lots of play time and time together. 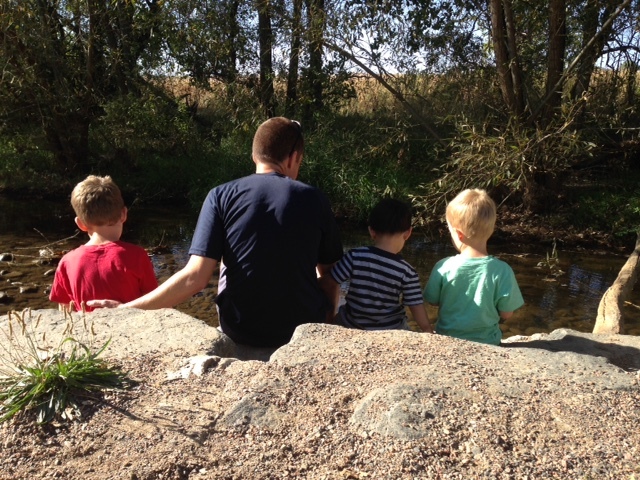 We went on a family run/bike/stroller ride yesterday morning which of course included mandatory rock throwing in the stream. 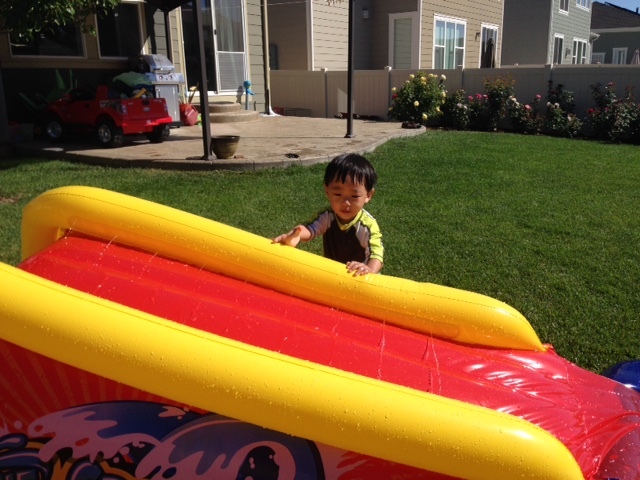 And it was warm enough we pulled out the slip-n-slide and the boys had fun with that. Edric had a few more tears yesterday and I expect that he will for awhile. He’s still grieving losing his foster family. I managed to get the bags all unpacked yesterday and got to go through the book that I had had made and given to foster mom to fill out and in it she included a photo of her and Edric when she picked him up the first day. She also included two small photo books with photos of his last two years. As Edric grows I don’t have a lot to tell him about his first two years, but now I have some photos to show him and the memories that foster mom wrote down. There is so much loss in adoption, it starts with loss of a family, and because of that there is loss of memories, knowledge, understanding, connection, and often culture and traditions. And so to be able to get some glimpses of those first two years through the photos that she sent and things she wrote down is precious beyond words and helps with take away some of that loss. Last night was a little rougher, I think the change in time zones affected Edric as he was up from 11ish-4:30ish. Clint laid in bed with him last night and I got to sleep in our bed which was a huge blessing. And so I expect today will be a little rough. Thankfully we have a Savior that is stronger than we are and we can lean on and rest in his Strength. And now I hear some early morning stirrings….let the day begin!